While hearing loss is becoming more common, it often goes ignored. Some people don’t realize they have hearing loss, or think that their hearing loss is normal for their age. Others are in denial, and think that admitting they have hearing loss will make them seem old. 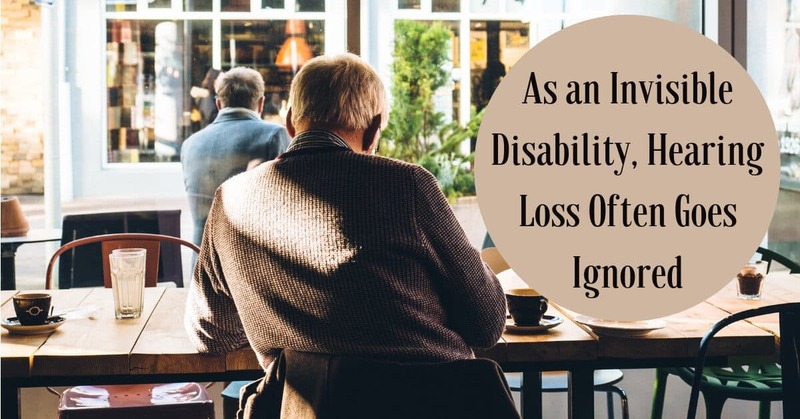 Whatever the reason, ignoring this invisible disability has some major consequences. Hearing loss has often been called an invisible disability. It affects nearly 40 million Americans of all ages, but there are no visible markers to signal to others that you have a disability. Unlike having a cast on a broken bone, or sitting in a wheelchair, people with hearing loss look just like everyone else, and it’s impossible to know just from looking at them that they’re struggling to hear. With no obvious external signs of hearing loss, this disability often goes unnoticed and untreated, with only about 1 in 5 of those needing hearing aids ever seeking treatment. This is especially true for those with age related hearing loss. While hearing loss can affect people of any age, seniors are the most at risk of hearing loss. This is because of presbycusis, or age related hearing loss. As a normal part of aging, the cells in your ear begin break down from the wear and tear of listening your whole life, and cells will start to deteriorate or die. Presbycusis is the reason that half of all seniors over the age of 75 experience hearing loss. However, just because presbycusis is related to aging doesn’t make it normal, or mean that ignoring your hearing loss is a healthy choice. If you have age related hearing loss, the first sounds you’ll start missing are high frequency, or high-pitched sounds, like your grandchildren’s voices, or the sound of birds. You’ll start to have difficulty following conversations, particularly in places with a lot of background noises. You may also turn up the volume on the TV or radio, and your family might complain that it’s too loud even though you think it’s just right. If you’ve been struggling to hear, but think it’s just a normal part of aging, stop hiding behind the invisibility of hearing loss, and reconsider treatment. Do you think your hearing isn’t too bad, or that getting hearing aids won’t change anything? Ignoring hearing loss is a big mistake, and will cost your far more than missing out on a few words every now and then. Living with untreated hearing loss has been closely linked to difficulties in your relationships, as you’re not able to communicate easily with your loved ones. You’ll have a hard time interacting with your friends, and may start staying home from social functions rather than face the embarrassment of asking someone to repeat themselves, or answering inappropriately. Those with untreated hearing loss often face social isolation, loneliness, depression, or other mental health concerns. The brain is also affected by hearing loss. Not only are your auditory centers impacted by your hearing loss, but other parts of the brain suffer when you have hearing loss. If you’re struggling to hear, you’ll start to experience more rapid cognitive decline, and will notice problems in memory and recall. Hearing loss, and the rapid changes in the brain that go along with it, makes those with hearing loss more at risk of developing dementia or Alzheimer’s Disease. Sadly, this is another area where hearing loss is invisible, and many seniors diagnosed with cognitive disorders aren’t asked to take a hearing test. It’s time to take notice your hearing loss and stop ignoring this invisible disability. Don’t let hearing loss hold you back, but visit us today at My Hearing Centers for a hearing test. Hearing loss might be invisible, but the consequences of untreated hearing loss are no joking matter. Take control of your hearing health and of your future, and discover what hearing aids can do for you. Not only will our discreet devices sit snuggly in your ears, they’ll help you hear the world around you in a whole new way, and allow you to get back to participating fully in all areas of your life.